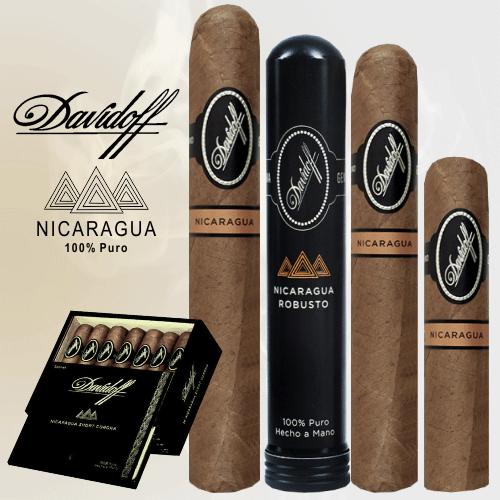 Davidoff Nicaragua Series | Chicago's Pipe, Cigar & Tobacco Store | Iwan Ries & Co. It is not often that Davidoff comes out with an entirely new line of cigars, but when they do, Davidoff’s devoted patrons set high expectations. The all new Davidoff Nicaraguan line of premium cigars is far surpassing these expectations. The Nicaraguan line is the definition of cigar perfection. The Davidoff Nicaraguan comes in a variety of sizes, tubos, singles, and boxes as well as four and five packs. These cigars start with a light, mellow flavor reminiscent of a warm summer day. Light and airy, the Nicaraguan imparts flavors of hay and cedar with just a hint of cocoa and coffee. These sticks are beautifully constructed golden brown works of art emblazoned in two classy cigar bands that exude the ultimate quality that is Davidoff!